SWAC public schools closed Monday ... snow day! Local public schools kids get an long weekend with the announced closings of Staunton, Waynesboro, and Augusta County public schools on Monday as some roads remain icy and treacherous. Grace Christian in Staunton will also be closed. Check for all closings here. White snow ... blue sky. 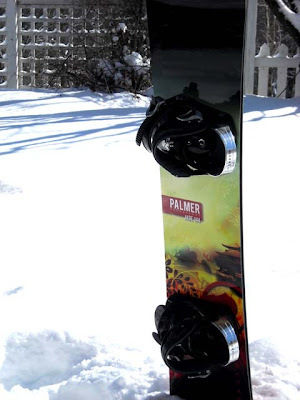 SWAC Daughter's snowboard waits for its next run down the back yard. Sounds like a great event in California where Dr. Donald Douglas blogs at American Power and where he attended what sounds like a great event featuring Rep. Michele Bachmann and conservative activist David Horowitz. Donald has lots of great photos and commentary. 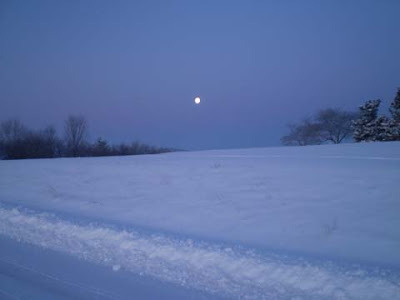 Moon over the snowy Appalchians at 6:00 a.m.
Brrr! It's cold enough to freeze your icicles off. Yesterday's snowstorm continued into the night and this morning we see we picked up more accumulation to up our total to about 10" of snow in our corner of western Augusta County. On top of that the temperature is minus 3! That's frigid! The sun is out this morning and our daytime high is expected to be in the upper 20s. There will be some melting but then cold temps tonight will make it freeze on the roads again. And listen to this: the weatherman said there's more snow coming next weekend with possible "substantial" accumulations. We are finally having a snowy winter. The water table has to be about recovered by now after a number of years of drought/dry weather. In memory of Lance Corporal Jason Redifer, 19, USMC ... First Battalion, 2nd Marine Regiment, Alpha Company ... from Augusta County, Virginia, who was killed in action in Iraq five years ago today, January 31, 2005. Semper Fi. "For those who have fought for it, freedom has a flavor the protected will never know." President Obama and Justice Alito ... Light Horse over at Virginia Virtucon says "That was a step too far." Miss Virginia has won the Miss America Contest! For the first time in years we're watching the Miss America Contest. Why? He's a judge ... imagine that! He was approached by the Miss America Contest to be a judge, something he talked about on his show while trying to decide whether to accept the invitation. This week he has been in Las Vegas ... Monday and Tuesday Mark Steyn filled in on the radio show because Rush and the other judges were extremely busy. But Rush was back on the air for Wednesday, Thursday, and Friday's shows ... and he talked about what a wonderful experience he was having with the Miss America crew and how much fun it had been. Tonight he's in a tux on the front row of the judges' tables and I'm loving it. Update: Miss Virginia, a VCU student from Fredericksburg, is the new Miss America! SWAC Daughter snowboards in the yard. Snow is still softly falling in the white winter landscape as darkness approaches. We've gotten about 8 inches so far, a pleasant surprise after the weatherman had predicted only 3-6". Talked with a friend in Roanoke earlier and they had gotten 10" as it still came down. SWAC Daughter is outside snowboarding on the ski run she made down the hill and into the woods where she has a mogel jump. 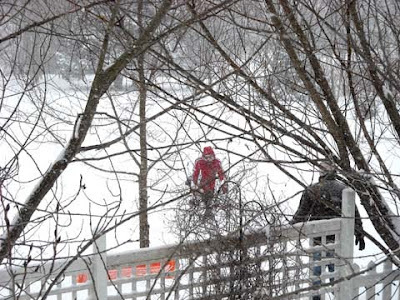 Meanwhile, the next-door neighbor drove over on his tractor and cleared our driveway, then headed to his barn to clear a path. What would we do without neighbors? Here's yet another case of spinning liberal bloggers and leftist media rushing to judgement with lies instead of getting the facts about James O'Keefe. Donald nails them over at American Power. As Rush said last week, there's more to this story than meets the eye. Beware of the leftists and their spin machine. There is a huge multi-car pile up in the southbound lanes of I-81 in Shenandoah County north of Harrisonburg. The area remains under a winter weather storm warning until 11:00 pm. Fishersville Mike doesn't like the snow? 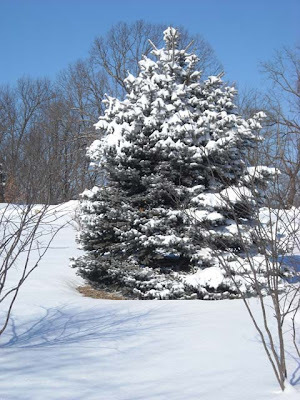 The alpine spruce is majestic in the latest snowfall. Snow is falling so heavy that the ridge behind the house is not visible. SWAC Daughter walks up hill with her snowboard as others use the sled. How cold is it? 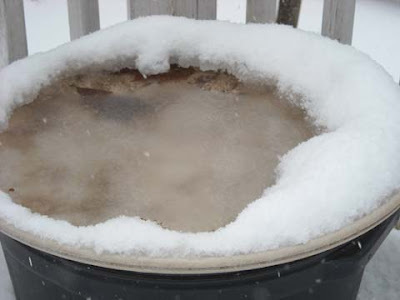 It's so cold that the heated birdbath has slushy water in it. Temperature at mid-day was 15 degrees. Something tells me Mike isn't crazy about the snow today. 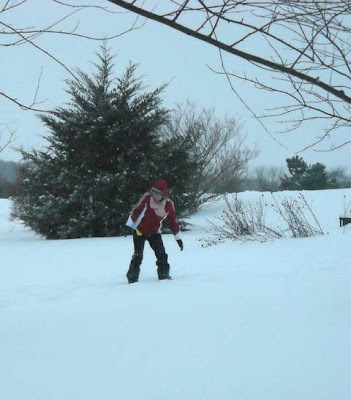 Meanwhile, we're yipping at our house ... SWAC Daughter is heading into the back yard with her snowboard as the flakes continue to fall. With the woodstove cranked (because the temperature is mid-teens at 1:00 pm ... brrr), I've got a roast and veggies cooking and we have apple cider and hot chocolate to warm us up. Snow is still falling heavily so we ventured outside to take photos and watch SWAC Daughter surf the back yard. The snow was mid-calf on me and in five minutes I was completely covered. The wind chill is in the single digits and it is cold! Update: Mike wrote to say they have a birthday party tomorrow for one of the boys so this snow is gumming up the works. I understand ... this would put a damper on something like that. They could let the kids make a birthday snowman for his son complete with party hat and balloons tied to its stick arms for a birthday to remember. Meanwhile, Bob has taken snow photos in his part of Augusta. Gorgeous. Update #2: Many thanks to Pat Austin at And So It Goes In Shreveport for the link. The bird feeder is busy this morning as cardinals, blue jays, titmouse, and juncos gather in the heavy snow. Juncos sit on fence pickets like yard ornaments. 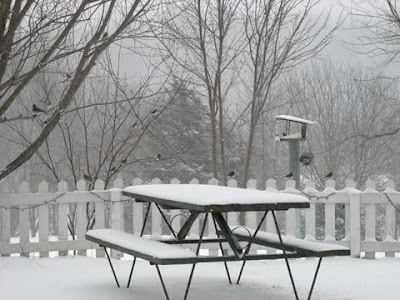 The birds like to gather under the picnic table out of the driving snow so we scatter bird seed there for those who don't want to be in the feeder. It's a snowy day in the Shenandoah Valley ... 12 degrees out there ... and snow is all over the Commonwealth as a winter storm that had marched across the country zeroes in on the east coast. The Weather Channel even suspended their Friday afternoon "Storm Stories" to actually cover the weather since so many were affected, and this morning snow is steadily falling in western Augusta County. I love a snowy day. The world slows down ... outside the only sound is the occasional soft scratchy sound of falling snow and birds at the feeder. 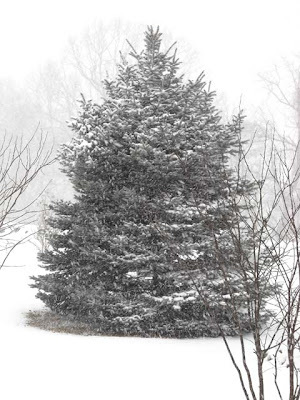 As I look out the window, the back yard is filled with cardinals, blue jays, titmouse, and juncos in the trees as they take turns at the smorgasboard ... snow is falling heavily coming in from the north with about 3" already on the ground. Richmond is expecting a foot of snow so SWAC Niece will be enjoying her own Snow Day. It sounds as if the brunt of this southern snowstorm will be the southern and eastern parts of Virginia. I'm checking Weather.com for updates and radar. The Weather Channel talked with Andy Doernen from WRVA Radio in Richmond during the 7:00 hour to get the latest conditions there. Local weather is available from Harrisonburg's WHSV TV-3, Charlottesville's NBC-29, the Waynesboro News-Virginian, Staunton News Leader, and local Weather Channel coverage. Sen. Mark Obenshain ... "The budget, voter ID, clotheslines ..."
Another week of session is behind us, and although actual budget negotiations still lie ahead, producing a balanced budget remains the matter on everyone's mind. The budget will be balanced, of course; the law requires it. The real question is how we'll go about it, and that's where the members of the General Assembly go their separate ways. One of my colleagues across the aisle, Senator Edd Houck, made it clear where the other side stands, calling for tax increases and speaking of the importance of preserving government jobs. Houck's most likely target is the car tax - cutting the $950 million reimbursement to local governments, which will result in re-imposition of the full car tax and an additional bill, likely to average between $450 and $600, for virtually every household in Virginia. No one wants layoffs, and certainly, one hopes that any necessary staff reductions will come through eliminating vacant posts, but my colleague's comments underscore a fundamental difference of opinion on the government's role and function. Governments employ people, and many of those employees are fine civil servants, but governments do not exist for the purpose of employing people; they exist to provide essential services. If we can deliver those services more efficiently, we must do so. Governor McDonnell has made it clear that he will not sign any budget that includes tax hikes. I firmly believe that we can meet our budget challenges without raising taxes, but to do that, we all need to be on the same page -- and soon. The House of Delegates recently voted 97-0 to reject Tim Kaine's income tax surcharge proposal, and I strongly believe that the Senate should follow suit, allowing us to all work from the knowledge that tax hikes are not on the table. Yesterday, fourteen other members of the General Assembly and I unveiled the legislative priorities of the Conservative Caucus, a group I co-chair with Delegate Ben Cline which exists to provide a forum for conservative members of both chambers to discuss and work with each other to advance a commonsense conservative agenda. You can read the full agenda, which includes several of my bills, here. Another one of my bills died on a party line vote in committee this week. The bill, which would have required voters to provide some form of identification, is a simple, commonsense approach that has met with bipartisan support in other states. People disagree on the extent and impact of voter fraud, but we should all agree on simple, unobtrusive measures to combat it. I understand the fears that new requirements will create additional burdens for eligible voters, but my bill takes pains to avoid this, permitting utility bills, government checks, pay stubs, and other forms of identification to be used in lieu of photo ID. Similarly, those who cannot produce any form of identification when they come to vote would be given the opportunity to cast a provisional ballot, which will be counted if they can later demonstrate their eligibility. It s a fair solution, I think, and it s one that courts have routinely upheld and that the bipartisan Carter-Baker Commission, headed by former president Jimmy Carter and former secretary of state James Baker, have strongly endorsed. It's also an idea that went down to defeat the other day, as SB 134 was passed by indefinitely on a 6-5 party line vote in committee. Given the evidence that a problem exists -- a Johns Hopkins University Study identified 1,500 deceased Marylanders who had "voted" in recent elections, one county in New Mexico found 75 registrants at a single address, and right here in Virginia, campaign headquarters, vacant lots, and non-existent addresses have all been listed on many registration forms -- it's disappointing to see such a bill rejected. Elsewhere, you may have read about the pending transfer of convicted murderer Jens Soering to Germany, a request approved by Tim Kaine during his final days in office. If you're not familiar with the case, Soering was convicted of the brutal murder of his girlfriend's parents in 1985 and is currently serving two life sentences, with his girlfriend sentenced to ninety years as an accessory. In one of his final acts as governor, Kaine filed the requisite paperwork to transfer Soering to Germany -- without consulting with or even notifying the victims' families before the decision had been made -- where he is expected to be released after two years (and in no event held more than ten). The other day, I signed an open letter to U.S. Attorney General Eric Holder penned by my colleague, Senator Steve Newman, urging him to deny the transfer. Also, have you heard about the latest in green technology, the alternative energy clothes dryer that harnesses solar and wind power? Some of us grew up calling it a clothes line, but here in the General Assembly it's a "natural drying device," and it's creating quite a stir. No surprise, really. The newspapers get to trot out every possible groan-inducing pun, with one article in the Richmond Times-Dispatch alone saying the legislation "stretch[ed] out the Senate" and speculating that it would "get blown away" in the House, where "the prevailing winds were against it," despite the fact that it "breezed through the Senate." So let's shine some sunlight on this thing, shall we? (Yes, I'm doing it, too.) Clotheslines have been around forever, and they're a fine and cost-effective way to accomplish a routine household chore. At issue, though, was whether they should be permitted in communities with restrictive covenants despite ordinances to the contrary -- whether, in other words, someone who bought property with the understanding that certain restrictions were in place should have no say in a change in the terms of his agreement with the homeowners' association because of a mandate handed down from Richmond. I say no. There are few legitimate reasons for government to override private contracts or interfere with contractual property rights, and this is certainly not one of them. And it's just one of the odd trifles that keep cropping up this session, even as we prepare to take on a far more pressing challenges. Finally, this week afforded me an opportunity to meet with some friends and neighbors from the district, which is always one of the highlights of my weeks here in Richmond. Members of my local Chambers of Commerce, credit union employees, members of police and sheriffs offices across the district, and representatives of various local businesses, including from the hospitality and tourism industry, all stopped by, along with many other constituents. As always, I enjoy hearing from my constituents, so if you're in Richmond, feel free to stop by, and even if you can't do that, you can always pick up the phone and call my office at (804) 698-7526 or email me at mark@markobenshain.com. I look forward to hearing from you! In the past, winter weather in the Shenandoah Valley would bring out VDOT salt trucks. When salt brine first began showing up on the streets around the SWAC area, word was it was more environmentally friendly -- someone even claimed it was a beet juice base -- and VDOT was able to treat road surfaces before bad weather hit. Snow in the forecast? Even if we hadn't heard the weatherman, it was obvious that inclement weather was on the way because of the streaks on the roads. With this weekend's huge winter storm expected over Virginia, the brine streaks began showing up Thursday afternoon in preparation for snow, and today they were on just about every road we traveled. A friend clued me in about two weeks ago to the problems when he suggested I may want to get my vehicle washed of all the white salt/brine/dirt after weeks of snow on the ground, and said car owners had been having trouble with corrosion, especially on the undercarriage. He said the work vehicles with the company he worked for had been having issues with corrosion from the brine used by VDOT. Then today I read Yankee Phil's post about that briny stuff with even more explanation of it. I am optimistic about our future and will continue working for our great cause of liberty. My optimism for the future of the 10th District is also founded on the knowledge that we have a very well qualified, thoughtful conservative ready and willing to lead in the 10th District and the Commonwealth—Dave Schmidt. 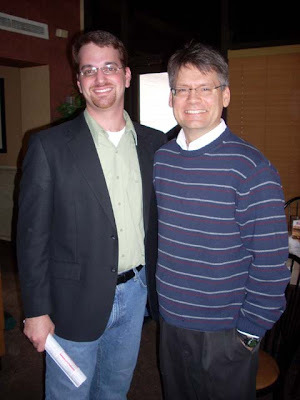 I strongly endorse Dave as the next 10th District chair. He is a limited government Jeffersonian, a successful businessman, a hardworking Republican who has put in years of service for our cause including strong support for 10th District activities and events. He knows how elections are won as he himself has won a seat on the Leesburg Council. Dave has always supported Congressman Wolf and Republican stalwarts like Ronald Reagan and Bob McDonnell. Most important, he is a man of character. Please give Dave your favorable consideration. See you on the campaign trail. Many eyes will be watching the race in the 10th District. 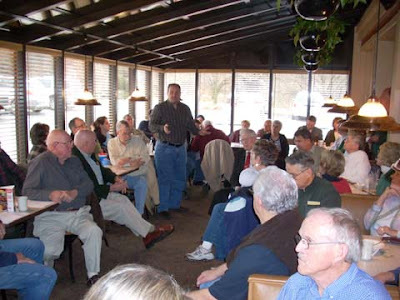 A fellow RPV Central Committee member with 20 years spent as 10th District Chairman and over 30 years in the trenches will have many wonderful memories and some battle scars when he retires at the end of this term. Thank you, Jim Rich, for your leadership. Richmond ... Snow is coming! Snow is coming! Head to Ukrop's! I grew up in Richmond with the snow warnings and Ukrop's runs and everything else this article tells us about. My mom, who is snug in her home in Richmond fully stocked up on provisions and looking forward to the snow, sent this over for a few giggles. Those of you in Richmond ... head to Ukrop's! According to the Richmond Times-Dispatch and every meteorologist in town, Richmond is going to get a nice snowfall this weekend … up to a foot, some people say. The snow is supposed to start as early as Friday afternoon and continue into Saturday. In case you're new to Richmond, let me tell you how we do it here. - Someone, somewhere, says snow is coming to Central Virginia. - We Richmonders start paying attention. - Someone says it's coming to Richmond. - We Richmonders really start paying attention. - Someone brandishes the word "accumulation." Tuesday morning: The word "accumulation" is used. Tuesday afternoon: Accumulation confirmed. All weekend plans put on stand-by or out-right canceled. Tuesday evening: First trip to Ukrops for bread, milk, and cookie dough. Wednesday morning / afternoon: Calls around town for sleds begin. For the record, Richmond.com is one step ahead. No one has any sleds but Pleasant's is expecting a shipment on Friday. Wednesday evening: Second trip is made to Ukrops for extra bread and milk, plus frozen pizzas and non-perishables, because you never know. Local news does a story about the 'run' on Ukrops for bread and milk. Thursday morning / afternoon: Spend workday obsessively checking the forecast. More calls for sleds. Search online for sleds, but decide against them because you can't believe how much sleds actually cost. Thursday evening: Meet friends out for dinner because you never know when you'll get out again. Realize you forgot to buy bagels. How could you forget bagels? Third trip to Ukrops. Friday morning: Alternate staring out window for snow and consulting forecast for exact snow start time. Cancel the rest of your weekend plans. Friday afternoon: Weather.com reports that it is snowing in your area. Run to window. Spend at least an hour yelling at weather.com because it is clearly not snowing. Ask boss about company's inclement weather policy. Complain about said policy. Wait an hour; ask boss if company is closing early. Friday evening: Fourth trip to Ukrops, on the way home, for last-minute necessities - like chocolate and fancy hot cocoa. Alternate staring out window and watching local news for exact snow start time. Watch the Closings scroll to see if your work is closed on Monday, because you never know. Friday night: Snow finally begins. Call/text all of your friends and family to see if it's snowing in their area and to make sure they're OK in the storm. Update Facebook status to reflect snowfall, in case you missed anyone. Order pizza so you don't have to break into rations too soon. Saturday morning: Marvel at snowfall. Fling pets / children into the snow so they can marvel and so you have pictures for your Facebook page. Saturday afternoon: Drive or trudge to nearest hill and attempt to sled on a cookie sheet/shower curtain/trashcan lid/pool float. Saturday evening: Meet friends out for dinner to celebrate the snow. Sunday: Eat leftover pizza and stare out the window, watching the snow melt. Obsessively watch Closings list. Feel happy when the schools in your county will be closed, and then sad because you never became a teacher --- and now you have to go out, clean off the car and then go to work tomorrow. PLUS - you've got all that bread and milk to eat and drink! Too funny ... and too true. We Richmonders, even those of us who have relocated to other areas of the state or country, still know the drill when inclement weather is on the horizon. I'm heading to the grocery store -- sadly, there are no Ukrop's in the Shenandoah Valley -- stocking up on wood, and ready to get the chili pot going. The snow is coming! H/T to Mom ... enjoy the snow! The Bill O'Reilly-Glenn Beck "Bold Fresh" tour scheduled for tomorrow night, January 30, in Norfolk, Virginia, has been postponed due to the approaching winter storm bringing the potential of snow, ice, and other winter weather across the Commonwealth. Glenn Beck announced the postponement on his radio show at about 10:30 Friday morning and said the tour would be rescheduled for Friday, May 21, 2010, at the same venue. A decision was made this far out so those traveling from other areas would have a heads-up instead of a last-minute cancelation. Check winter weather for the Shenandoah Valley at WHSV TV-3. Liberals love to spin lies on the internet ... especially liberal lawyers posing as bloggers ... and the same holds true in the James "I Broke The ACORN Story" O'Keefe story. These people have turned off their phones, or they're redirecting calls from constituents to go somewhere to a dead line, and then they're saying, "Our phones are jammed. Nobody can get through. We don't know what's wrong." I bet you... I don't know this. I'm just speculating. But I'll bet you O'Keefe and his buddy who posed as telephone repairmen were in there to try to find out if somebody had jimmied with the lines so that constituents could not call the office and complain. I'm just wild guessing, but don't doubt me. I wouldn't be surprised if that's what O'Keefe was doing. NY Times: "The 3 Facebook Settings Every User Should Check Now"
More changes have already occurred at Facebook that users should be aware of. Facebook began as the anti-MySpace, a safe harbor to protect its users and their privacy. However, a series of changes the past months have many questioning what Facebook is doing and why. In December, Facebook made a series of bold and controversial changes regarding the nature of its users' privacy on the social networking site. The company once known for protecting privacy to the point of exclusivity (it began its days as a network for college kids only - no one else even had access), now seemingly wants to compete with more open social networks like the microblogging media darling Twitter. Many young people use the site openly, talking back and forth and trading photos as if they were private correspondences with friends. And therein lies the problem. What began as a relatively small closed internet neighborhood has the potential to explode into the Google search engine system. Photos of the guys on a wild drinking fishing trip -- or any photos or careless writing -- could end up in the hands of a potential employer or worse. The face of Facebook has changed ... be aware. You will want to read this article about the many changes in this giant social network before it turns into your own personal giant social nightmare. As the Times says, take five minutes to check your status and be sure it is what you want it to be. This is a representative republic, not a banana republic, and let me remind you: Karl Marx and Saul Alinsky are not our Founding Fathers. This is a nation built on individuality, built on liberty, free markets, and faith. Yet you, Barack, demand fidelity to a different belief system: A system that crushes individual initiative and free will. The president does not berate Supreme Court justices who are guests of the Congress and who have no ability to respond to your attacks. I love it when Bob goes hiking and posts the photos at The Journey because I get to experience the trail, too. The winter woods present a special look at nature ... the world opens up without leaves on the trees to block valley views ... hidden treasures can be seen at this time of year. 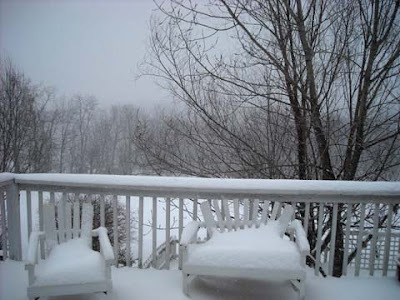 Winter in the Blue Ridge Mountains ... special. Thanks, Bob! A young man who is special to our family lost his paternal grandmother today. After several years of failing health, she passed away quietly overnight in her sleep. My family especially wants to pass along our condolences to Alex and his family as we keep them in our thoughts and prayers. Evelyn Lipscomb died Thursday morning, January 28, 2010. She was born in Granite Falls, NC, on July 3, 1926, a daughter of James H. and Nellie Taylor Radford. She was preceded in death by her first husband, well-known WTON radio host, Albert Wakefield "Bob" Davis and her second husband, H. Robert Lipscomb, Jr.
Mrs. Lipscomb was employed by Senator Thomas Kuchel (R-CA); Admiral Forrest Sherman, Chief of Naval Operations, Pentagon; several Staunton law firms; and retired from ASR (Verona) in 1991. She was a member of Trinity Episcopal Church. Surviving are her son and daughter-in-law Tracey W. and Pam Collie Davis, a grandson Alex O. Davis, and granddaughter, Kacey E. Davis of Staunton. A service will be held in Granite Falls, NC. Federal officials say they are investigating an explosive device that was set off on train tracks near a college campus in Harrisonburg, Va.
Rich Marianos, a spokesman for the Bureau of Alcohol Tobacco and Firearm, said local residents reported hearing a boom about 6:30 a.m. Thursday. He said local police have investigated and determined there was an explosive device on train tracks near the campus of James Madison University at Cheapeake Street and Cantrell Avenue. He said there were no injuries and terrorism is not suspected. He said ATF and the Harrisonburg police department have launched a criminal investigation. He said ATF has sent seven people to the scene, including two explosives experts. MSNBC Chris Matthews: "I forgot he was black tonight for an hour"
... or any other conservative out there. Read more at Newsbusters. Unbelievable, pull-your-hair-out words came out of the mouth of Barack Obama during his "Lies of the Union" address before the American people Wednesday night. Tonight, Barack Obama said, "To close that credibility gap we must take action on both ends of Pennsylvania Avenue to end the outsized influence of lobbyists; to do our work openly; and to give our people the government they deserve. "That's what I came to Washington to do. That's why - for the first time in history - my Administration posts our White House visitors online. And that's why we've excluded lobbyists from policy-making jobs or seats on federal boards and commissions." Maybe this explains why his national security policies are so weak. He put William Lynn in the Pentagon as Deputy Defense Secretary. Mr. Lynn was a lobbyist for Defense Contractor Ratheon. I guess the Deputy Defense Secretary is not a policy-making job. Michael Strautmanis, chief of staff to the president's assistant for intergovernmental relations, lobbied for the American Association of Justice from 2001 until 2005. The mainstream media are criminally negligent, in my opinion, in not doing their jobs. No wonder there is a continuing rise in the conservative blogosphere ... but I keep holding out for a few journalists who will actually be concerned for their country and do the right thing by beginning to bring the discrepancies to light. Meanwhile, Fox News continues to lead in truthful reporting as millions flock to them for fair and balanced news coverage. Thank goodness for top-rated Glenn Beck, #1 talk radio host Rush Limbaugh, #2 radio host Sean Hannity, Red State and all the other conservative internet outlets ... and of course the top-rated Fox News Channel. Liberal women's groups make me tired. Unless you agree with and think like them, they want nothing to do with you. So much for "women's equality" ... hypocrisy once again raises its ugly head. The latest controversy is a pro-life Super Bowl ad that will feature football player Tim Tebow saying his mother did not get an abortion 22 years ago ... because of that, he became a Heisman Trophy winner and will be at the Super Bowl conveying the pro-life message. What's the problem? Liberal women's groups say they are "offended" because the ad is "likely to convey an anti-abortion message." Are libs concerned it will be a pro-LIFE message? Would those women prefer Tim Tebow were killed in utero? Bravo to Tim and his mom, Pam, for standing up to tell the story. Boo-hisses to the lib women's groups who propose to be for women's rights but obviously do not stand for Pam Tebow's right to choose. Nehemiah was distained by his enemies Sanballat, Tobias and Geshem as well. But in the end, had there been no Nehemiah, there would have been no rebuilt Jerusalem. "You've never turned the wrong to right? You've been a coward in the fight." "If you have integrity, nothing else matters. If you don't have integrity, nothing else matters." - Alan Simpson, long-time U.S. senator from Wyoming (1979-1997). Sponsored by Home Educators Association of Virginia, the annual Homeschool Day at the Capitol will be held Thursday, April 8, in Richmond. Make your study of Virginia government and history come alive! Teach your children how our government works, and make a significant impact on the Virginia General Assembly. Join homeschoolers from all areas of the Commonwealth for HEAV's Day at the Capitol. The Blue Tour is already filled, but there is still space left in the Red Tour. For more details about Day at the Capitol, see DATC FAQs. A simple Voter Identification Bill (SB 134) proposed by Sen. Mark Obenshain (R-Harrisonburg) was voted down in committee by the Democrats. Obenshain's voter identification bill would require voters to show some form of identification at the polls, and expands the list of identifying documents to include utility bills, bank statements, paychecks, and government checks. Currently, individuals who fail to bring identification may vote by signing a statement in lieu of showing identification. The Supreme Court has upheld similar laws in other states, and by adding alternative forms of identification, Obenshain's bill ensures that no eligible voter is disenfranchised by the inability to produce the forms of identification required under current law. In 2005, the bipartisan Carter-Baker Panel, headed by former president Jimmy Carter and former secretary of State James Baker, recommended identification requirements stricter than the ones contained in this legislation. Senator Obenshain represents the twenty-sixth district in the Virginia Senate. The district includes the city of Harrisonburg and the counties of Warren, Shenandoah, Page, Rappahannock and Rockingham (part). 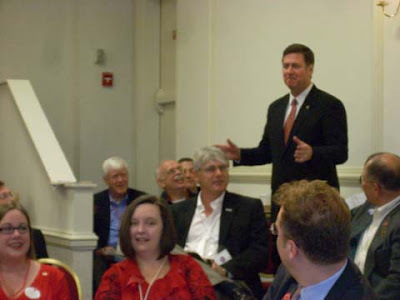 George Allen at GOP Advance in Williamsburg ... December 2009. Did you know that the last week of January is Virginia's official "Home Education Week"? Thanks to the work of Home Educators Association of Virginia, Governor George Allen declared the first Home Education Week in 1995. 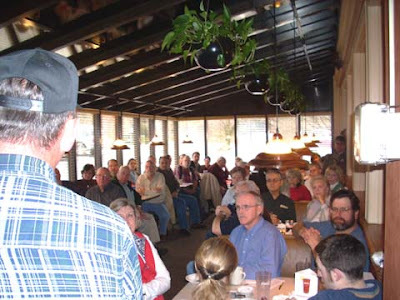 Message from Americans to politicians: "Cut the spending"
Shenandoah Valley folks listen to Churchville attorney Francis Chester address the Augusta County assessment issue and his recent sanction after being countersued by the Board of Supervisors. There was an enthusiastic outpouring of support for the folk hero now known as Robin Hood. Friends and neighbors ... there was standing room only. Mike Shull talked BOS issues and the need to rein in spending. 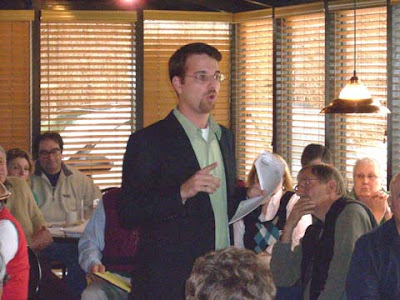 David Karaffa was energetic and encouraged others to consider running for public office. Suzanne Curran energized the crowd with her powerful words to get involved, stand up, and be heard. Francis Chester walked through the crowd as he spoke. Mr. Chester has spent hours working pro bono on behalf of over 10,000 citizens of Augusta County in the real estate assessment case. Jason Bibeau talked about budget cuts. Many familiar faces listen to speakers with folks attending from Shenandoah, Harrisonburg, Rockingham, Augusta, Staunton, and Waynesboro. 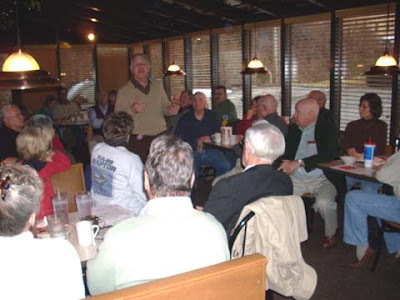 Local conservative leader Kurt Michael led breakfast. 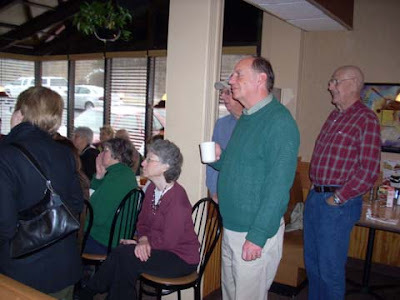 The crowd listened intently as our wonderful waitress made the rounds. 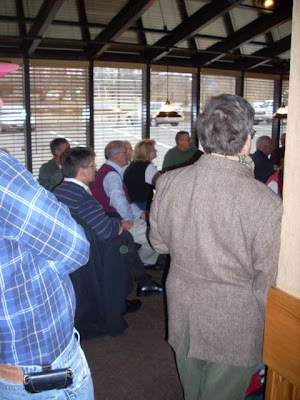 On Saturday morning, January 23, 2010, over 70 conservative activists from Staunton, Waynesboro, Augusta, Rockingham, Harrisonburg, Shenandoah, and beyond who consider themselves Independents, Tea Party Patriots, conservative Republicans, Constitution Party, and more met at the Staunton Shoney's for fellowship, to contribute to the conversation, and learn how to become more active in local conservative politics. 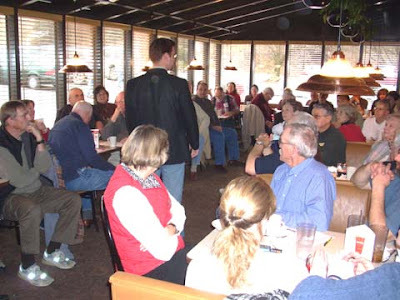 Breakfast was led by local conservative leader Dr. Kurt Michael who emphasized that the SWAC Conservative Round Table is not a political party or organization but rather a gathering of like-minded conservatives who care more about their country and community than they do about political labels. 2) Educational ... a place to educate each other on current conservative thought and to keep each other informed of current events and issues. A variety of conservative leaders addressed the crowd. Churchville attorney Francis Chester was introduced by Kurt Michael as Augusta County's "Robin Hood," a name given to Mr. Chester by Judge Victor Ludwig, to cheers and applause from the crowd. Mr. Chester recapped the year-long real estate assessment case in which he has represented 10,600 county citizens pro bono. After Augusta County countersued Mr. Chester for what they called a frivolous lawsuit, Judge Ludwig sanctioned him with a $2,000 fine and compared him to Robin Hood in his opinion letter. Mr. Chester received rousing response -- applause and cheers -- after the update to his battle that he has fought on behalf of over 10,000 citizens. Michael Roman and Ed Long have joined forces to form a Defense Fund for Mr. Chester to appeal the sanction. Sign-up sheets for volunteers and contributions were collected. To help contact Michael Roman. Lyn Bing and Sue Ward were recognized for their help lining up bus trips on behalf of the Shenandoah Valley Tea Party. 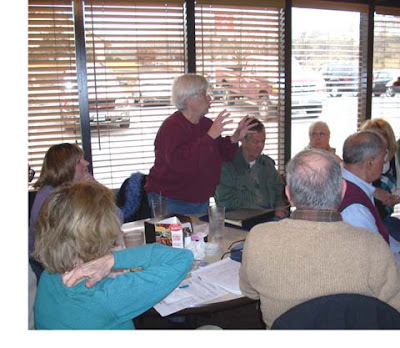 Pam Richmond, wife of Tea Party Director Bruce Richmond, announced that the next Tea Party meeting will be held on Thursday, February 4, at 7:00 p.m., in the upstairs meeting room of the Staunton Public Library. We send get-well wishes to Bruce who recently took a fall on the ice. 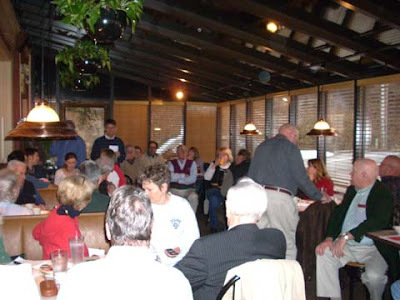 Dave Mason, chairman of the Augusta County Constitution Party, thanked everyone for their efforts in recent elections and particularly in the Massachusetts special election earlier this week when Republican Scott Brown won the seat formerly held by Ted Kennedy. Lynn Mitchell, 6th District Representative on the RPV Central Committee, thanked everyone for coming out and for their help in the Scott Brown race in Massachusetts. She told the crowd that in Nevada many conservatives were working to defeat Harry Reid ... 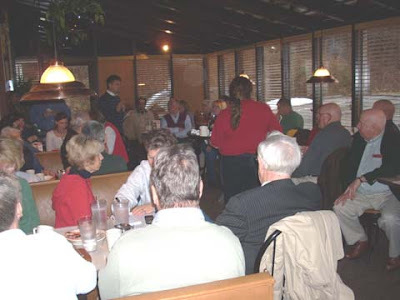 Tea Party Patriots, ResistNet, local 9/12 groups, Free Republic, Ron Paul supporters, Libertarians, and conservative Republicans ... a group much like the SWAC Conservative Round Table Breakfast. Michael Palmer announced that Florida U.S. Senate candidate Marco Rubio will have an internet money bomb sometime on February 10 to raise money for his campaign, sponsored by the Senate Conservatives Fund (SCF). A recent money bomb for Scott Brown raised $1.3 million in 24 hours. Dean Welty with the Valley Family Forum unveiled the prototype of the proposed "In God We Trust" Virginia license plate. All the information is here. 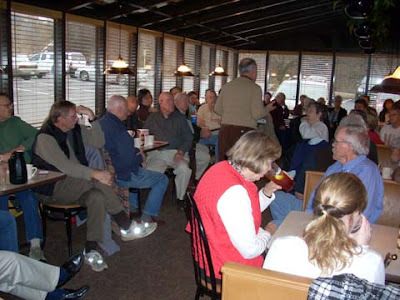 Dean also gave a heads-up to the Forum dinner on May 24 when special guest speaker will be David Barton of www.wallbuilders.com. If interested in attending, please contact Lynn Mitchell. More information will be coming. Suzanne Curran, conservative activist from Shenandoah County, encouraged all to speak out publicly and stand behind candidates and people like Francis Chester who are out there fighting for We the People, and said we cannot let these good folks stand alone. She also emphasized that we need to become vocal and loud and public with the judiciary system. Michael Shull, who is considering running for the Augusta County Board of Supervisors in the Riverheads District, brought out cheers and applause from the crowd when he began by saying, "I'm just an ole country boy and I ride around the county in my old pickup truck." He said changes are needed in the real estate assessments ... that we're losing 11 deputies due to budget cuts but we have to stop overspending in the county ... every BOS meeting has more and more spending and there is a need for fiscal conservatives. David Karaffa, another who is considering running for the Augusta County Board of Supervisors in the Beverley Manor District, began by introducing himself as an RN at Augusta Health Care which brought cheers from the crowd. David emphasized the need for term limits and said the President of the United States only gets two terms ... that's all other office holders should be allowed. He also made a plea that everyone consider running for public office or look around to find others who would run for office. Lyn Bing encouraged everyone to be vigilant about health care even though Scott Brown won in Massachusetts ... be aware the Democrats will continue to try and get the bill through. Bob Kirchman and Jason Bibeau made comments about local spending and the need to curb that. 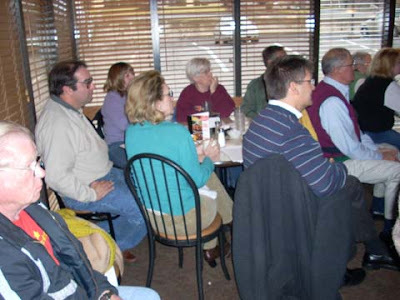 One attendee made the following comment: "I want to be an American. I've quit the Republican Party. Conservatives are pulling people in ... these Republicans (Augusta County) are just pushing people out." SWAC bloggers Augusta Water Cooler, Augusta Conservative, and The Journey were there along with SWAC Girl. We want to thank Shoney's for their hospitality and thank our waitress who was exceptional. 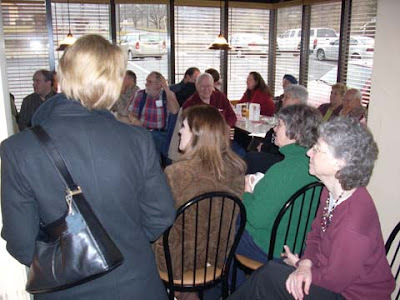 Our appreciation goes out to all who joined us to make it another successful breakfast with uplifting discussion. The weekend flooding in the Shenandoah Valley and surrounding mountains took a toll on Rt. 250 on the western side of Afton Mountain between Waynesboro and the mountain top. A huge chunk of highway fell away in a "slope failure" which could also be called a mudslide. 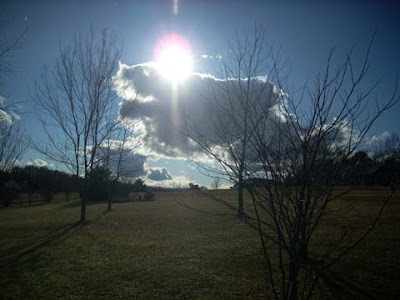 See this News-Virginian photo by Rosanne Weber. We all hoped Morgan Harrington would be found alive even after going missing three months ago after a Metallica concert in Charlottesville, Virginia. 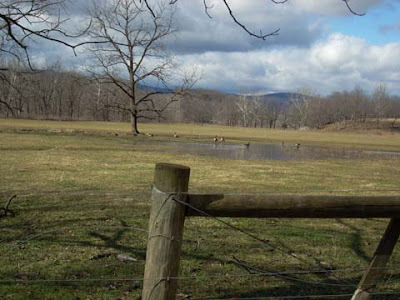 The grisly discovery in the remote Anchorage Farm field in Albemarle County is every parent's nightmare. If positive ID confirms what police suspect, the search for Morgan ends on a sad note and the search for a killer moves forward. Our prayers to the Harrington family who held out hope to the end. - Twitter search for "Morgan Harrington"
Fishersville Mike has the line he'd like to hear at tonight's State of the Union Address to the Nation. Ditto. Check Politico for other interesting numbers from the poll. Fox News ... ranking #1 of all primetime news outlets the week of the Massachusetts special election. 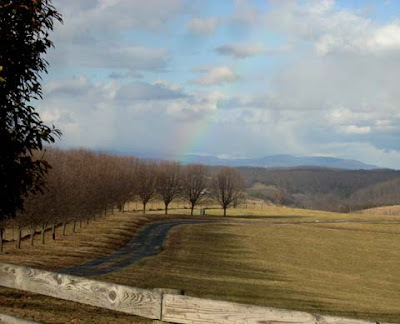 ... a rainbow appeared over the Shenandoah Valley. 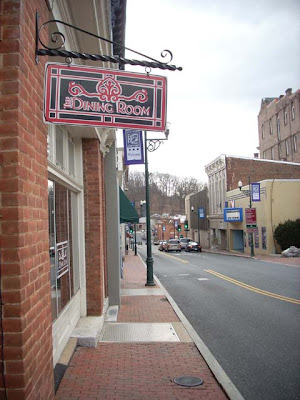 The Dining Room is located on North Augusta Street in historic downtown Staunton. I headed into Staunton today to meet friends at The Dining Room Restaurant for lunch and conversation on an overcast, cold day in the central Shenandoah Valley. I was able to watch the snow flurries throughout lunch out the large front window that overlooked Augusta Street and see people passing by who were brave enough to be out in the blustery winter chill. Crab soup was on the menu but I ordered my favorite ... chicken salad with cranberries and dill dressing on a croissant. My friends had Philly steak sandwiches and soup, and then we all ended with a white chocolate creme brulee. Yummy. Tuesday nights are Jazz Night from 6:30-9:00 with Jennifer Kirkland and Bert Carlson. Have a seat at the bar or grab a cozy table and give a listen. Try the wide array of seafood selections that include oysters ($16), scallops ($17), King Crab legs ($14), mussels ($15), trout ($14), lobster tail ($26), coconut shrimp ($16)... or maybe some stuffed chicken ($15) or parsean crusted chicken ($12) ... or surf and turf ($17-$26), pasta ($10-$12), filet mignon ($24) or maybe the New Zealand rack of lamb ($26). They also serve burgers, sandwiches, and salads. Stop by for good times at The Dining Room. 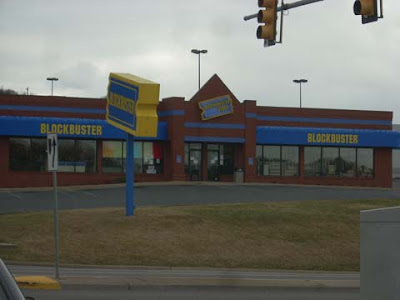 Blockbuster on Statler Boulevard in Staunton has closed its doors as the former video giant downsizes in rough financial times. New McDonald's located in front of the Target Shopping Center off I-64 on Rt. 340 in Waynesboro. The beautiful Blue Ridge Mountains are in the background. 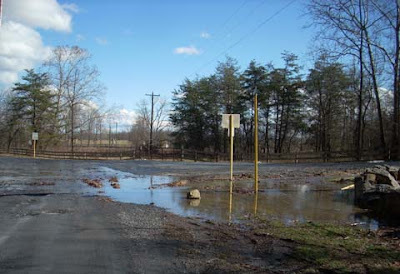 ... this roadway in western Augusta County where water from the Middle River was several feet deep. 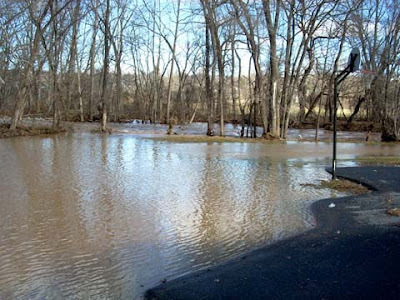 After 24 hours of steady downpours, creeks and rivers overflowed their banks all over the Shenandoah Valley. 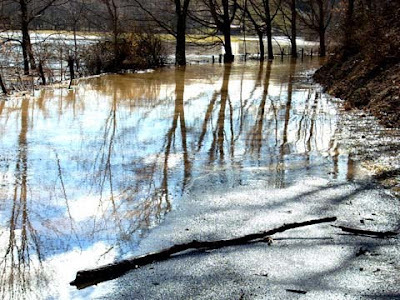 Public schools in Augusta, Rockingham, Shenandoah, Page, Orange, Madison, Nelson, and Rockbridge were closed on Monday due to flash flooding. 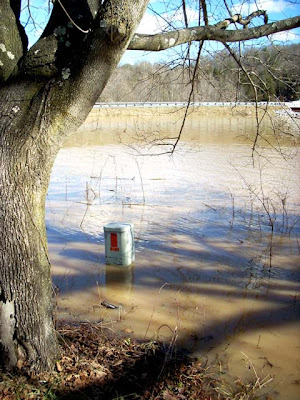 Utility post in the overflow of the Middle River where it flows under Rt. 250 west of Staunton. The bridge is to the far right of the photo ... everything else is normally a field but on Monday had turned into a huge lake. 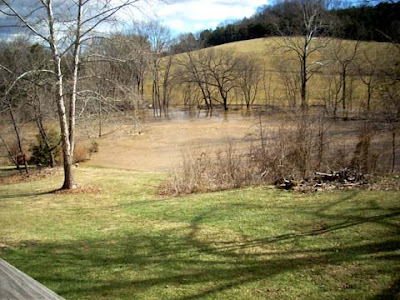 The back yard of friends' home on the Middle River normally extends to where the trees can be seen in the middle of the water. They were safe in their house high on the hill. View of the flooded Middle River from our friends' rear deck. 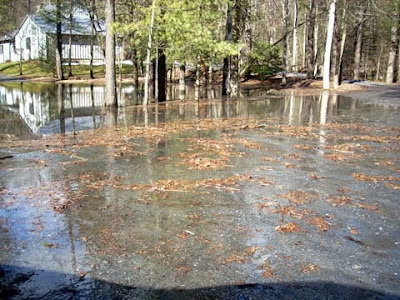 Flooded driveway in western Augusta County. 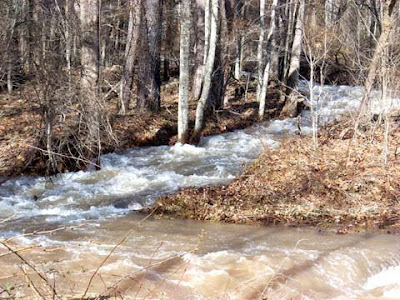 Even after water had receded in other areas, this stream was still roaring at mid-day on Monday. 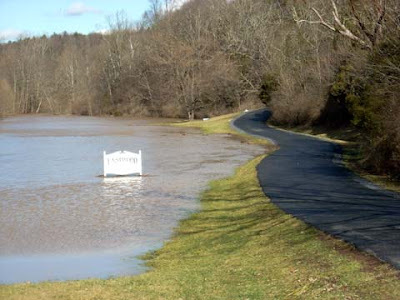 Entrance to Eastwood Subdivision west of Staunton where the Middle River overflowed. Canada geese enjoy a makeshift pond in a flooded field. 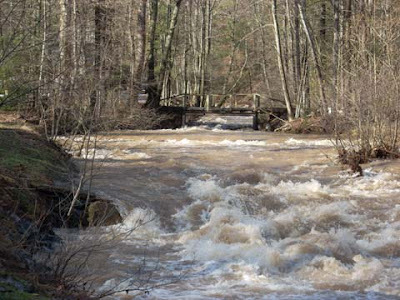 Whiskey Creek was still lapping at the surface of this low bridge at mid-day. This is normally a tiny little trickle coming off the mountain. 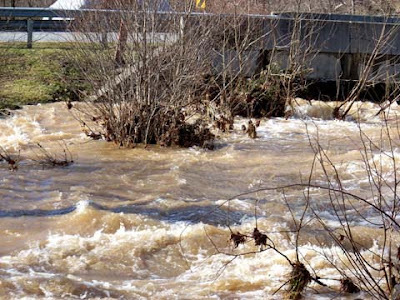 Whiskey Creek roars toward Churchville. 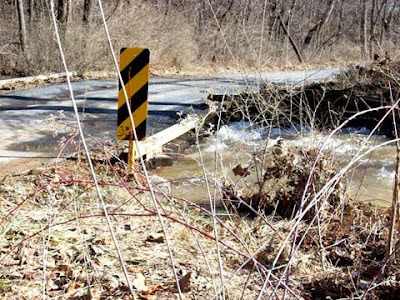 Roadway is flooded with water erosion. 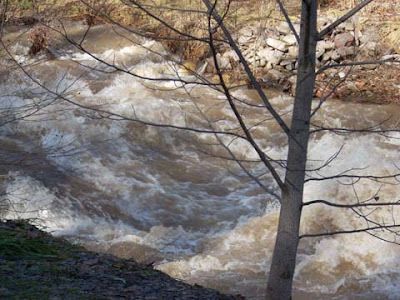 Dangerous waters in a normally placid creek. 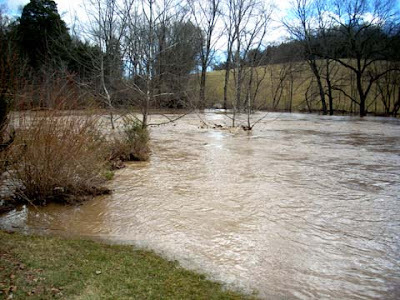 Water gushes in this mountain stream in Pastures District in western Augusta County. 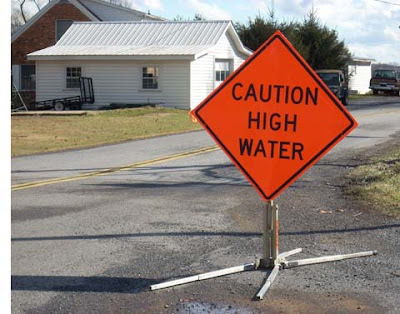 High water signs were seen throughout the county. Behind St. James Church in Churchville. 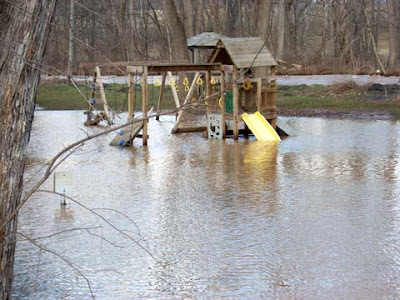 Churchville community park where picnic shelter, horseshoe pits, and playground were all flooded. The playground behind St. James located on Rt. 250 in "downtown" Churchville. The church had 1-2 feet of water in the basement but members were out bright and early Monday morning pumping out the water and the ladies were in the kitchen clearing out the lower cabinets and cleaning up. 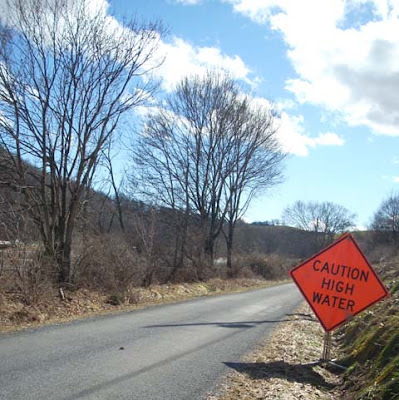 With local schools closed due to flash flooding and the sun peeking through overcast skies, we drove the backroads of western Augusta County Monday and saw many roadways that were flooded, some with erosion water damage. 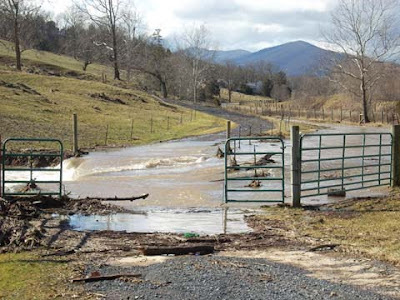 Pastures District, where much of the area is national forest, had much flooding due to the watershed effect as thousands of gallons of rain water flowed down the mountain slopes, forcing streams out of their banks and washing out roads. 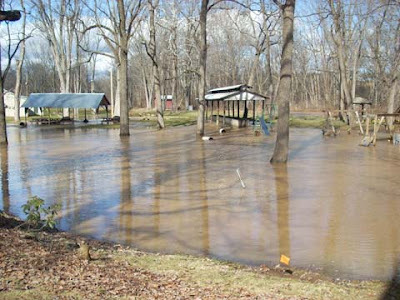 Many areas that had been covered in water earlier in the morning were just a muddy mess by mid-day. In other areas water still ran across the road but it was still passable ... other areas were not passable due to several feet of water. Who says home schoolers don't have fun? Specter to Bachmann: "Act like a lady"
Massachusetts to Obama: "Can you hear us now?" Water Cooler calls it "KenneChusetts no more"
"We were going to vote for Coakley ..."
Massachusetts: Dems turning on Coakley? Tuesday ... "Another Boston Tea Party"? Mike pens a "Teabagger Anthem"